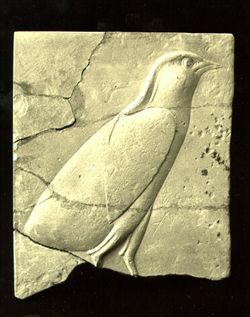 On a small rectangular slab of limestone, a standing quail chick is depicted in high relief. The object has broken into several pieces, the lower part with the feet is missing. The modelling and the execution of the relief are very fine. The object could be a votive plaque, but, as this bird is a very common hieroglyph (Gardiner G43), it is more likely to be a sculptor's trial piece or model.